How does a retinal scanner works? The retina is a thin tissue composed of neural cells and thin blood vessels that is located in the posterior portion of the eye. 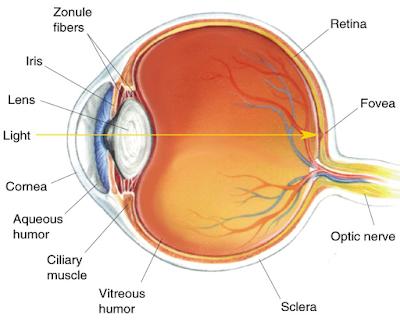 The purpose of the retina is to receive light that the lens has focused, convert the light into neural signals, and send these signals on to the brain for visual recognition. Because of the complex structure of the capillaries that supply the retina with blood, each person's retina is unique. The network of blood vessels in the retina is not entirely genetically dictated. Even identical twins do not share a similar retinal pattern. Retinal biometric exploits this uniqueness. A retinal scan is performed by projecting a beam of low-energy infrared light into a person’s eye as they look through the scanner’s eyepiece This infrared light beam traces a circular path on the retina at the back of the eye. The blood-filled capillaries absorb more of the infrared light than the surrounding tissue. Because of this, there is a variation in the intensity of the reflection. Instead of storing complete image ,the scanner measures this reflection at difference points along the beam path. A standard scanner measures reflection at 320 points. It then assigns an intensity grade between zero and 4,095. The resulting numbers are compressed into an 80-byte computer code and stored in data base.We have already seen that retina blood vessel pattern of each person is unique. So chances of spoofing is so little. Retina scanning is often confused with iris recognition. Even though both rely on unique physiological attributes of the eye to identify an individual,there are certain differences in the way they work. Iris Recognition uses a camera, which is similar to any digital camera(NIR:Near InfraRed camera), to capture an image of the Iris. Iris scanner uses mathematical pattern-recognition techniques on images of the irises of an individual’s eyes, whose complex random patterns are unique and can be seen from some distance. Nowadays iris scan is preferred over retina scan due to its advantages. While the accuracy of retina scan can be affected by diseases; the iris texture remains extremely stable because it is internal and protected, yet externally visible part of the eye. Less tampered: Since iris is inside our body chances of tampering is very less. Less chances of theft since it is always inside your body. Speedy results: Identity of the subject is verified very quickly. They do not require as much computer memory as other biometrics like fingerprint scan, voice recognition etc..
Invasive:Retina scan requires a very close encounter with the scanning device by using a beam of light deep inside the eye which is considered to be invasive and this may leads to eye problems. Medical application: Retinography or retinal scanning also has medical applications. Communicable illnesses such as AIDS, syphilis, malaria, chicken pox well as hereditary diseases like leukemia, lymphoma, and sickle cell anemia impact the eyes. Pregnancy also affects the eyes. Likewise, indications of chronic health conditions such as congestive heart failure, atherosclerosis, and cholesterol issues first appear in the eyes. Protect your personal data:Retina scanner phones and Iris scanner phones are already out there in the market. Most of the leading smartphone companies like apple,Samsung,Microsoft prefer iris scan over retina scan.Many app builders are also coming with retina scanner for android. But reliability of such applications are quiet doubtful. Share this article and like our fb page for more informative and interesting technical articles.